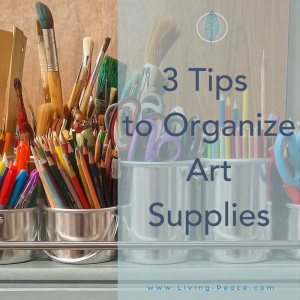 For those of you who have a lot of art supplies for yourself and/or your kids, here are some ideas on how to organize them. Keep in mind who will be accessing them and if the storage is easy to utilize. Remember that the more steps there are like removing the bin, then opening/closing bins to remove the items, the less likely it will be a good long-term solution since more steps usually impede the ease of using the storage (especially for returning items to their homes). Another suggestion is to use written or picture labels to aid in returning items to their homes. – Clear mason jars are a great way to collect smaller items like buttons, sequins, beads; they come in many sizes, and are easy to see. You can use the lids as well if they need to be transported anywhere or stacked for storage. – Another option for smaller items is a drawer unit like this one. Each drawer can hold individual items, or even like-with-like (think hot glue gun with glue sticks; adhesives; sewing accessories), and you can pull out each one to use during the crafting session. I would definitely encourage labels for each drawer on this type of solution. – Magazine holders are a versatile storage solution when it comes to paper, magazines/pictures (for collaging), and larger bottles of paint. Speaking of paint, although utilizing a larger bin might seem like a good idea, be careful that the weight of it won’t be too much for the user to take in/out of the storage area. What unique ways have you used to store your art supplies? Let us know in the comments!